﻿Load Capacity	Up to 1250 lbs. 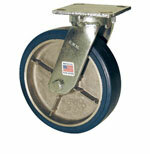 • Kingpin: 5/8" or 3/4"
• Kingpin & Nut: 3/4"
﻿Load Capacity	Up to 1400 lbs. • Swivel Section: 3/8" ball bearings mounted in a precision machined raceway. Zerk in swivel section. • Swivel Section: One row of 3/8" ball bearings mounted in a heat treated precision machined raceway. • Zerk in swivel section. • Swivel Section: One row of 3/8" ball bearings mounted in a heat treated precision machined raceway. Zerk in swivel section. 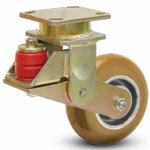 • Optional Overall heights of 91/2 for 8" wheel diameter models add -01 to end of model number. ﻿﻿Load Capacity Up to 1000 lbs. ﻿• Large Diameter Swivel Raceway: Both upper main load bearing and lower thrust bearing utilize large diameter raceways and 5/16" hardened steel ball bearing for easy maneuvering under heavy loads. Hydraulically staked 5/8" king pin provides years of trouble-free service. • Extra Strong Continuous Welded Side Legs: Yoke legs are formed from 1/4" thick steel and made wider to handle constant abuse from side thrust. Both sides are continuously welded to yoke base for added strength and endurance. • Heat Treated Moving Parts: All moving parts are heated treated to a precise molecular depth and Rockwell hardness using a gas carbonizing process that extends caster life under rugged conditions and shock loads. conforms to industry standards for quick and simple retrofitting. Replacement parts such as wheels, bearings, bushings and axles are also common sizes and readily available. ﻿Load Capacity	Up to 1000 lbs. 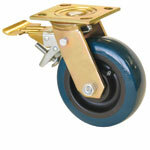 Ideal stabilizing caster for electric forklift trucks and pallet jacks. 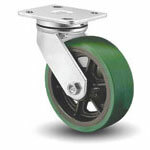 Springs located above the wheel provide excellent shock absorption within a narrow profile. 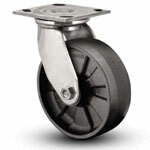 ﻿• 4-Sided Double Ball Raceway: Hardened steel ball bearings in the load bearing and secondary thrust bearings touch the swivel raceway “on all four sides.” This protects the central king pin from shock loading for free swiveling under heavy loads. • Thread Guards: Available on most wheels, keeps unwanted materials out of the wheel bearings thus increasing the life of the caster. ﻿﻿Load Capacity Up to 1250 lbs. ﻿﻿Load Capacity Up to 2000 lbs. ﻿﻿Load Capacity Up to 1200 lbs. 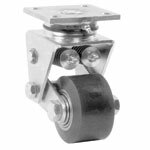 ﻿• One-piece swivel caster horn construction, no welds. Assures less failure, longer life. 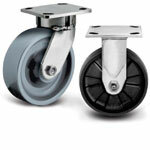 • Fewer swivel caster parts mean less chance of failure. • 3/4 inch king pin is orbit formed. Unitized design provides longer life. 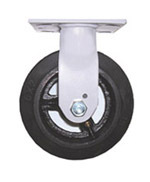 • Swivel casters have hardened top plate and fork to assure longer wear life to both upper and lower ball raceways. 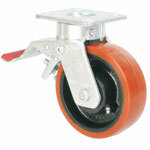 • Swivel casters have a nylon grease seal ring on the upper ball raceway. Keeps dirt out and retains a large grease reservoir. • Gray epoxy powder coat finish or zinc-plated finish available. • Meets ASMEB56.11.1 industry standards. • 4 x 4 1/2-inch top plate will fit into N22-QCP quick-change pad. ﻿• Design: kingpinless style swivel raceway. 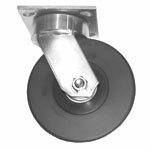 ﻿• Swivel Construction: 5/16” thick 1045 steel top plate; one row of 3/8” ball bearings mounted in a heat treated precision machined raceway. ﻿• Axle: 1/2” diameter with lock nut. ﻿• Fork Legs: 1/4” x 2” 1045 steel welded inside and out. 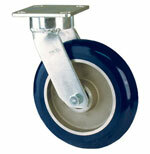 ﻿• Zerk Grease Fitting: swivel raceway and wheels with roller bearings. • Top Plate: 4" x 4-1/2"
• Specific Elastomeric Spring Elements available to suit different load ranges. • Kingpin & Nut: 5/8"
• ﻿Top Plate: ﻿﻿﻿﻿Cold formed from 1/4" steel plate. ﻿Withstands shock, continuous use and abusive conditions. 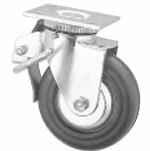 This medium duty series features our petented offset raceway for additional strength and is proudly Made in the U.S.A.
Raceway Design: Patented Kingpinless™ single ball bearing precision machined raceway hardened to 53 Rockwell C. minimum. 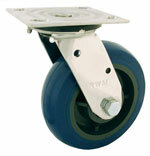 Swivel section features 2 1/8" diameter raceway with 1/4" ball bearings. Swivel Section: All swivel sections are supplied with a lubrication fitting for field maintenance. Notched yokes are standard. 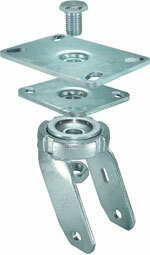 Mounting Plate Size: 4" x 4-1/2" x 1/4"
Recommended for a wide range of industrial caster applications. Proudly made in the USA. Raceway Design: Patented Kingpinless™ single ball bearing precision machined raceway hardened to 53 Rockwell C. minimum. 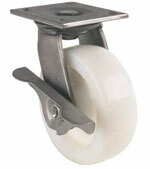 Swivel section features a 2-3/8" diameter raceway with 3/8" ball bearings. Swivel Sections:All swivel sections are supplied with a lubrication fitting for field maintenance. ﻿Load Capacity	Up to 1200 lbs. • ﻿Top Plate / Yoke Base: 1/4"
• Axle: 1/2” diameter, stainless steel hollow with roller bearing. Solid axle with Delrin and precision ball bearings. ﻿Load Capacity	Up to 700 lbs. 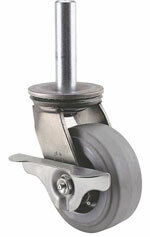 This unique caster offers both the top quality construction and performance of the SS Series with the versatility of a stem caster. Equipped with 5/8” kingpin construction, heavy 1/4” leg material and all stainless steel material, this is an exceptional product. 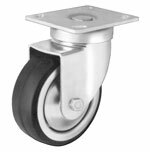 Wide selection of standard and custom stainless steel stems mean that this caster can be mounted in virtually any application. 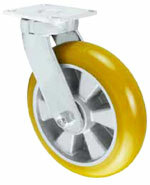 Large variety of wheel types and sizes to suit your many needs. 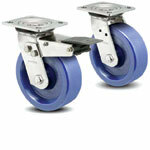 This caster uses the same top quality design that has made our signature “Bestway” Series an industry leader. Superior 5/8” nut & bolt kingpin construction with precision double ball raceways prove much more durable than riveted models. 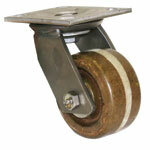 Heavy 1/4” material is used throughout for maximum strength and longevity. 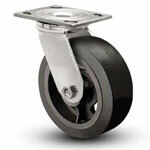 Huge selection of wheel sizes, wheel types, standard options and bearing types. ﻿Load Capacity	Up to 900 lbs. 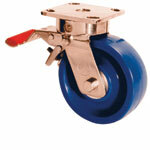 • Swivel Section: Cold forged top plate, yoke and button improves swivel action and increases service life. 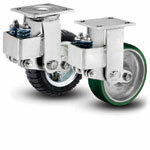 Heavy duty load and thrust bearings are ground and rotate on raceways. Top plate and legs are 1/4” steel, legs formed for increased strength and continuously welded to yoke. All swivel sections are equipped with a lubrication fitting for field maintenance. RWM lubricates all swivel sections prior to shipment. Notched yokes and sealed swivel raceways are standard. • Axle: 1/2” diameter drilled axle with lubrication fitting provided on casters to improve ease of lubrication where required (not required for ball bearing).